One of the problems with mapping Oldton is that things don't disappear all at once. Shops, in particular, have a habit of opening up and closing down all the time, so what used to be the toy shop is now a hairdressers, and the pub becomes a pole dancing club. 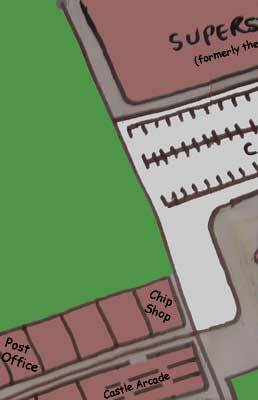 We can be fairly sure that the chip shop, with its square fishcakes, stuck around for some time, since both Muriel and Paul mention it, but I fear the cinema was replaced by a car park. The Castle Arcade housed a countless number of stalls and shops over the years. Pamela remembers the art shop (offering Oldton paint brushes). But, as Jonathan points out, only postcodes remain constant. I wonder what the Oldton postcode is?